BOSTON, Mass. 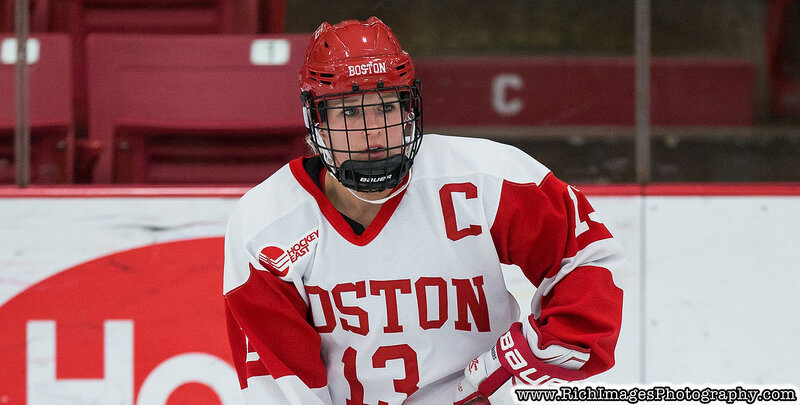 - Junior tri-captain Natasza Tarnowski tallied a career-high two goals to help lead the Boston University women's ice hockey team to a 7-1 victory over Holy Cross on Saturday afternoon at Walter Brown Arena. Tarnowski was one of six Terriers to light the lamp on Saturday. Freshman Courtney Correia led the Terriers with a career-high three points thanks to a goal and two assists while classmate Mackenna Parker, senior tri-captain Reagan Rust and redshirt junior tri-captain Sammy Davis all had one goal and one assist apiece. Junior Deziray De Sousa also found the back of the net. Sophomore Jesse Compher and freshman Kaleigh Donnelly each recorded two assists while junior Abby Cook, redshirt junior Abbey Stanley and junior Breanna Scarpaci each added one assist. Sophomore goaltender Corinne Schroeder made 18 saves in two periods of work and also assisted on a goal. Freshman Nicole McGuigan made the first three saves of her collegiate career in a perfect third period. BU (13-6-5, 10-5-4 WHEA) pushed its win streak to five games and also earned two points in the Turnpike Trophy series against Holy Cross (1-21-3, 1-17-1 WHEA). - Tarnowski opened the scoring just 4:04 into the proceedings when she redirected Donnelly's shot from the top of the zone. - Correia made it 2-0 just 55 seconds later when she got behind the Holy Cross defense thanks to a great feed from Cook. Correia deked the goalie and lifted a backhand top shelf for her fourth goal of the year. - Tarnowski tallied her second goal of the game with a fantastic individual effort at 11:33 of the first period. She skated through the Holy Cross defense and tucked the puck underneath Julia Pelletier's pads. - Rust completed the first-period scoring with her third goal of the year at 14:05. She corralled her own rebound, circled behind the cage and calmly deposited the puck into the vacant goal. - The teams traded power-play goals to begin the second stanza, with De Sousa striking first at 2:01 before the Crusaders responded at 9:08. - Parker made it 6-1 at 11:48 of the middle frame thanks to some nifty passing in the offensive zone by Davis and Compher. - Davis followed up her assist with her 15th goal of the year at the 15:21 mark to give BU a 7-1 lead through two periods. Schroeder left the puck for Scarpaci behind the net, and the junior defender raced up ice before firing a shot on goal that Jada Brenon stopped. The rebound popped right out to Davis, however, and the redshirt junior converted to close the scoring. - Compher leads the nation with 27 assists and is first among Hockey East skaters with 40 points. - She notched an assist for an NCAA-leading 19th different time this year. - Correia finished the weekend with four points thanks to a goal and three assists. - Saturday was Correia's third multi-point game of the season. - BU did not allow an even-strength goal in the weekend sweep. - Schroeder recorded her first assist since Oct. 22, 2017. - Nine different Terriers tallied at least two points this weekend. - Seventeen Terriers in total had at least one point against the Crusaders. - The Terriers will begin a home-and-home series against Merrimack on Friday, Jan. 25 at Walter Brown Arena. - Puck drop is set for 7 p.m.